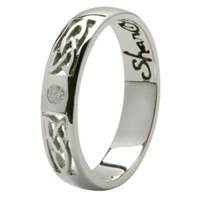 This Shanore wedding band incorporates a Celtic knot design which symbolizes a love never ending. It has been beautifully hand-crafted and is Pressure set with 1 Diamond in 14 karat White gold. Made in Ireland, Hallmarked in the Dublin Castle. This simple elegant ring is the perfect womans band.